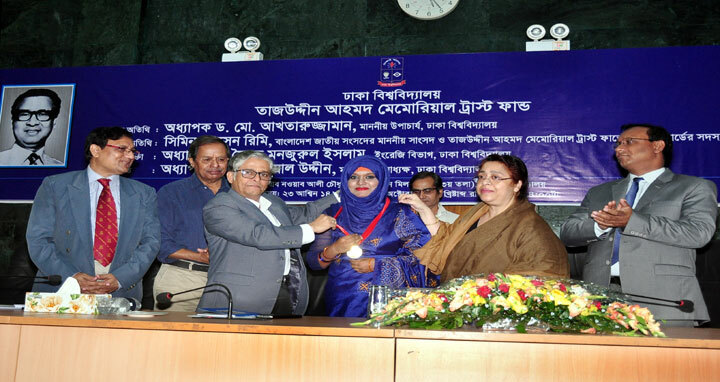 Dhaka, 09 Oct, Abnews: One female student of the Department of Peace & Conflict Studies of Dhaka University (DU) has been awarded ‘Tajuddin Ahmad Peace Gold Medal’ for her outstanding academic result in BSS Honors examination of 2015. Besides, one female student of the same department has received ‘Tajuddin Ahmad scholarship’ for her brilliant academic performance. Five other students from different departments of DU have received ‘Tajuddin Ahmad Trust Fund Prizes’ for securing the first, second, third, fourth and fifth places respectively in the essay competition. Dhaka University Vice-Chancellor Prof. Dr. Md. Akhtaruzzaman distributed medal, scholarship and prizes among the students as chief guest at a function held today October 08, 2017 at Nabab Nawab Ali Chowdhury Senate Bhaban of the university. Tajuddin Ahmad Memorial Trust Fund of DU organized the program. DU Treasurer Prof. Dr. Md. Kamal Uddin presided over the function while Member of the Trustee Board Simin Hossain Rimi MP addressed it as special guest. 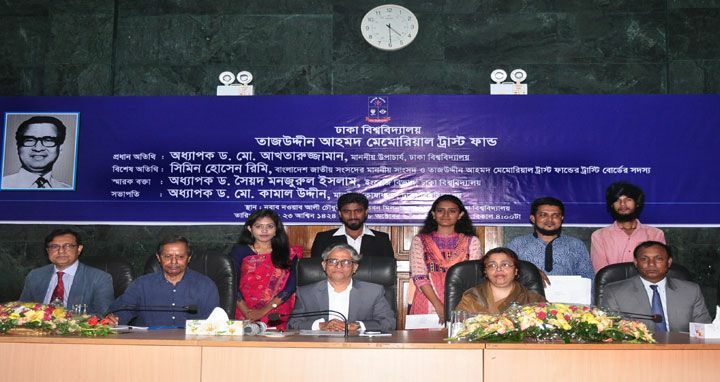 Professor of the Department of English Dr. Syed Manzoorul Islam delivered memorial lecture. Donor of the Trust Fund Mrs. Sharmin Ahmad delivered welcome speech through an audio message. Acting Chairman of the Department of Peace & Conflict Studies of DU Prof. Dr. Md. Rafiqul Islam gave vote of thanks. Acting Registrar Md. Enamuzzaman moderated the program. Dhaka University Vice-Chancellor Prof. Dr. Md. Akhtaruzzaman paid glowing tributes to the memory of the first Prime Minister of Bangladesh Tajuddin Ahmad and said he was an honest and patriotic politician. He was a close confidant of Father of the Nation Bangabandhu Sheikh Mujibur Rahman, the VC added. He urged the politicians as well as the young generation to become honest and patriotic citizen by following the ideals of Tajuddin Ahmad. The recipient of Tajuddin Ahmad Peace Gold Medal is Adiba Sultana Mim, a student of the Department of Peace & Conflict Studies of DU. The recipient of scholarship is Mahabuba Islam Meem, a 2nd year student of the same department. Besides, Arpita Hoque (English), Niranjan Bishwas Saikat (Law), Md. Shafiqul Islam (Anthropology), Ataur Rahman Maruf (Institute of Social Welfare & Research) and Md. Faridul Islam (Printing & Publication Studies) have received Tajuddin Ahmad Trust Fund prizes.